For some players, spring training is a time to dust off the rust, break in the glove, and readjust to the grind of daily baseball. These players have their positions secured. Players like Albert Pujols, Ryan Zimmerman, and Tim Wakefield know where they will be on opening day. For other players, spring training is their chance to secure their position on a major league team. Sadly, and somewhat ridiculously, the Shark is one of the players who will be fighting for his spot this spring. You will recall that last year (and the year before, for that matter), he was in this same position. Last year, he was battling Nyjer Mogan, then RicK AnKiel for the position. While he did not win the competition last season (which cause several Nationals players to become psychologically and physically nauseous), he was called up in April, our long Nationals nightmare was over, and the rest, as they say, is history. The battle kicks off again this spring, with the Shark battling several players for a position, including AnKiel, Jason Michaels, Brett Carroll, Xavier Paul?, and Mark DeRosa. To the outside eye, this may seem worrisome, but the eye of a Shark, worry is not an option. In fact, concern is not an option. 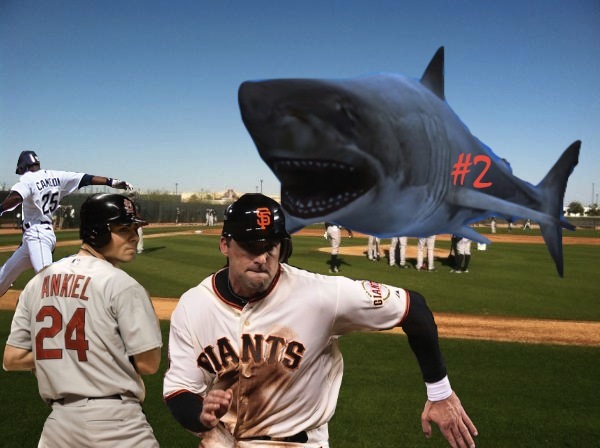 Pete Kerzel's article, Caught in a numbers crunch, Bernadina doesn't seem concerned talks about the different opportunities that the Shark has this spring, and how he's not worried about his chances. After all, why should he be? RicK AnKiel is an injury risk who strikes out more often than he gets hits. Jason Michaels batted .199 last season. Brett Carroll has a total of 5 home runs in his 5 seasons. Xavier Paul. I'm not sure if he actually exists. Mark DeRosa has 1 home run in the last 2 seasons and is 10 years older than Bernadina.